The United States Congress designated the Indian Peaks Wilderness (map) in 1978 and it now has a total of 77,932 acres. All of this wilderness is located in Colorado and is managed by the Forest Service and the National Park Service. The Indian Peaks Wilderness is bordered by the James Peak Wilderness to the south and the Rocky Mountain National Park Wilderness to the north. 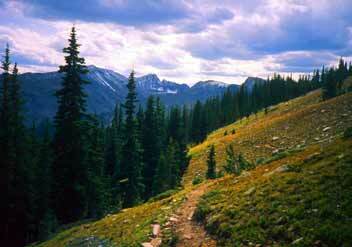 The Indian Peaks Wilderness is located primarily within the Arapaho and Roosevelt National Forest. Many of the peaks within the area were named for American Indian tribes of the west. Managed primarily by the Forest Service, a small sliver along the northernmost boundary lies within Rocky Mountain National Park. All of this sliver is above treeline where no camping is allowed, and contains only one trail, a Forest Service trail that loops into the park for about a mile due to the terrain. Overall, the wilderness stretches approximately 18 miles north/south and 15 miles east/west at its widest point. Elevations range from 8,300 to just over 13,500 feet. There are a total of seven peaks over 13,000 feet, and approximately 35% of the land area is above treeline. There are 28 maintained trails covering about 133 miles, and over 50 lakes. The icy remains of the last glacial period sculpted out the rugged terrain of the Indian Peaks. Chill winds off perpetual snowfields have created an environment near treeline of stunted trees and alpine plants unusual for this part of the state. The Indian Peaks is one of the most popular and heavily used wilderness areas in the country due to its close proximity to the Denver/Boulder metro area. Camping permits for the Forest Service portion of the wilderness are required for all individuals during the peak seasons, June 1 - Sept. 15. In addition, permits are required for all organized groups (scouts, hiking clubs etc.) for day use or camping any time of year. Campfires are prohibited on the east side of the Continental Divide and around most lakes on the west side. Rocky Mountain National Park to the north, also requires backcountry camping permits. There is a $20 administrative fee for park permits during peak season periods (non-refundable and non-exchangeable). Practicing Leave No Trace Camping and Hiking Ethics will help protect this beautiful wilderness area for future generations. Planning to Visit the Indian Peaks Wilderness? How to follow the seven standard Leave No Trace principles differs in different parts of the country (desert vs. Rocky Mountains). Click on any of the principles listed below to learn more about how they apply in the Indian Peaks Wilderness.